Ask the question “Do you have a mobile site?” to a lot of overworked professionals and they’ll groan, roll their eyes, or do something else to indicate this is just not something at the top of their priority list right now, and they’d rather not think about it. Yet, with so many people on the move, using a wide range of internet-capable phones, the timing is right to take a look at going mobile. Since I wrote Branding Yourself in Small Spaces and hypothetically redesigned an existing corporate mobile site, I have been chomping at the bit to get my hands on a real one. I have the perfect mentor, but haven’t yet had the opportunity to take on this new challenge. This week I discovered some free web tools that gave me the chance to play with mobile design, albeit in an indirect and less-than-perfect way from an information architecture and design perspective. However, even with the design limitations, I think anyone who wants to network and get the word out about their business should take a look at these tools. 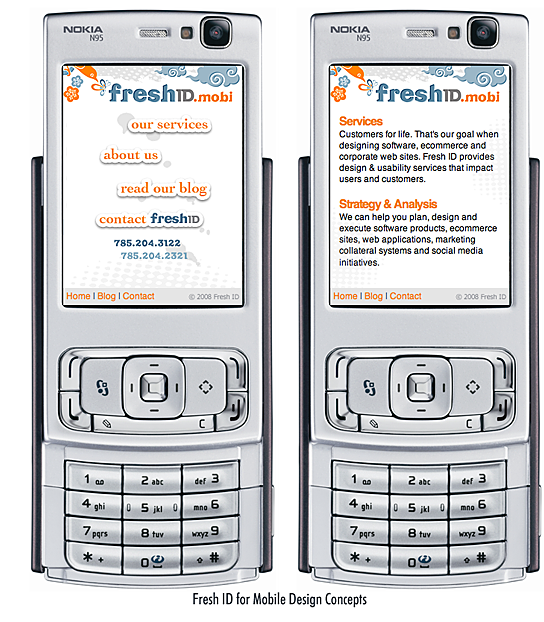 I have designed two sites for my company, Fresh ID and am trying to decide which one I will officially use with my new “freshid.mobi” domain name. Swift is a beautiful tool that allows you to literally create a mobile web site in minutes. 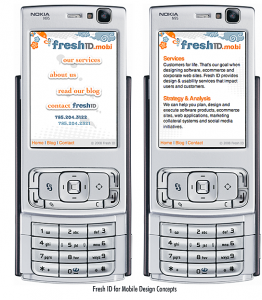 It offers the ability to make the mobile site your own by choosing colors and inserting graphics, which is the reason I started with it as my first foray into mobile design. It allowed me to add a page for this blog’s rss feed, which is nice because this is updated much more often than the Fresh ID site is. In fact, Swift focuses on bloggers who might just want a way to make their blog mobile. It is free if you want to show ads, or $10 per month to be ad-free. I went through a lot of trial and error with the design, which was exhausting, but I sincerely believe we should try to brand ourselves consistently regardless of the environment, so I wanted to put in the effort. I am not totally satisfied with the results… if I were designing this with developers, or wanted to spend the time learning all the applicable behind-the-scenes css and coding tricks to do what I want, I would approach the design differently – especially of the home screen. What I created at Swift is a nice first pass and usable, but not delightful, which is the emotion I ultimately want to evoke. Swift says, about growing your business, “Now, you don’t have to be a Fortune 500 company to have a great-looking, professional mobile Web site.” That is definitely true, and is the single reason I am sharing this information. I hope organizations of all sizes that read this will think about what they can do in the mobile space to promote their products or services, and I will provide some examples to get your marketing synapses firing at the end of this article. Another mobile site builder I wanted to try was mobiSiteGalore. I found them first, but ended up starting with Swift because they looked easier and had a more appealing interface. However, I’m glad I tested mobiSiteGalore because they are a lot more robust and have helpful marketing “Goodies” you can utilize to make your mobile site a lot more interactive. The site is fairly easy to use and comprehend (well, for a web professional like myself, that is.) Like Swift, they create the site for free and give you a custom domain name to use, but they also offer the ability to host the created site on your own server, which is a little unexpected for a free service like this. You can remove their “Made by mobiSiteGalore.com” link from the bottom of the pages for 95 Euros, or about $150 US. 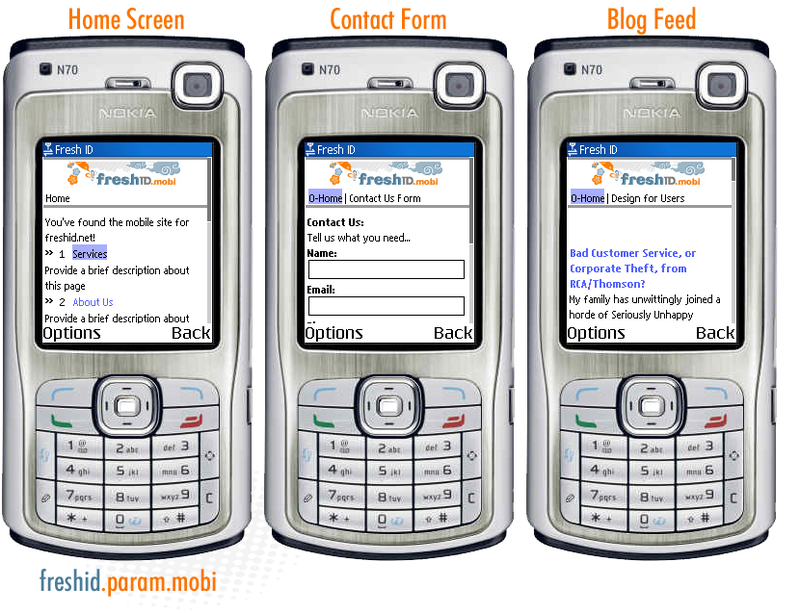 They are tightly integrated with ready.mobi (a mobile phone tester and emulator, and where these screenshots came from.) If you get into designing your own mobile site at all, you will become intimately acquainted with ready.mobi, as I found myself going back and forth constantly to test the results of my design efforts. mobiSiteGalore does this with each completion of your page design, and you get instant results of how well it is expected to work across various types of mobile phones. I found that my mobiSiteGalore site scored better than the Swift site did in terms of having the properly validated code and fewer errors. My main complaints, naturally, have to do with the design control. My header is tiny, whereas with the Swift site it resizes to fill the screen, and I had no control over the home screen’s appearance, like I minimally did with Swift. If I could combine these two products together, in addition to my wish list of design features being implemented, I’d have the perfect online mobile site designer! When I decided to take on this experiment, I had the benefit of some understanding of restraining my mobile site’s message to fit the context of the space, thanks to tutoring from a leading mobile design expert, Barbara Ballard of Little Springs Design. She believes in designing for the mobile web with “intelligent simplicity” but that is perhaps easier said than done. • What is the minimal amount of content from your site that someone might need online? Your full contact information is one obvious reason for being found online when people are searching, so definitely make pertinent content information a page in your mobile site, and use any SEO features offered, in addition to considering paid mobile ads, to be found in mobile searches. • What is the next most important thing people in a non-computerized environment might need to know? For Fresh ID, I felt the answer was about my services and a little bit about my background, which adds credibility. In reality, people want to see my portfolio, but I have directed them to the normal web site (when they’re in front of a computer) rather than putting these images online… for the time being. I have two clients who are manufacturers, Vertec Polymers makes plastic shapes that companies use to create products and parts with, and Titan Wood sells a special wood that is used in all types of structures and applications. Both of these companies sell to individuals and distributors, and a natural mobile site component for them, might be to have specific product information or datasheets (perhaps stripped down to essentials) that a buyer in the field could access if they had a question based on their need at the moment. A contact form that sends an email (such as mobiSiteGalore offers) to a sales rep would be awesome when someone has a quick thought, away from their desk, and wants to handle it now. 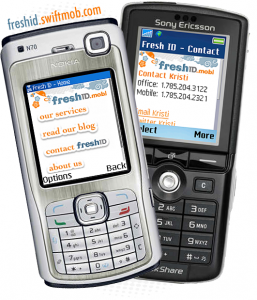 • What do people commonly do at my site, that I could let them do from a mobile site? VisualCV could let users send their resumes via the phone to someone’s email, so that if they get a call from a potential employer or recruiter, they can hang up and instantly send their visual resume to an email address. Phix could let customers order more energy drink powders from wherever they are at the moment… a thirsty mountain biker would never have to be indoors to get his Phix! EchoSign could allow users to send documents from a mobile site to someone’s email address so they didn’t have to rely on computer access to take advantage of closing a possible deal. Are you starting to formulate ideas for your own business yet? If not, check out the .mobi showcase to see real examples of mobile sites from all sorts of organizations, and visit the sites below for help to get your mobile site online. If you’re hungry for more information about mobile design, from industry experts, attend the Design for Mobile Conference in Lawrence, Kansas September 22-24, 2008! I use MoFuse http://www.mofuse.com/ for my blog to mobile blog site. The single most important repercussion from the embrace of the iPhone may be its influence on mobile design. Apple’s design influence carried over to the software developers who have created exceptionally thoughtful – and frequently delightful – applications that work perfectly on a 3.5″ screen. These developers have produced radically simplified sites that often work better than their full-sized web counterparts. This focus on simplicity and user satisfaction has inadvertently spawned a mobile design culture. BTW… I use the WPtouch WordPress plug-in to convert my blog to an iPhone, iPod Touch and Android ready experience.